As a child I hated sewing classes at school. Until I realised that if I said I’d left my sewing at home, the teacher would give me needles and wool and tell me to knit a square. I loved knitting; it relaxed me, gave me a purpose – to knit as fast as I could so I could complete the square by the end of the lesson – and made me feel content. Recently, knitting has made a bit of come-back and it’s now an accepted, even trendy, activity for people of all ages to do. Knitting groups and circles have sprung up in towns and cities around the world, and knitters are engaging on online forums and websites. What I discovered as a child, and what millions of knitters instinctively know, is that knitting can be a meditative, creative and social activity. But what most people may not be aware of is that there are many therapeutic benefits to knitting and it can be used as a tool for healing and wellbeing. Someone who is pioneering research into this field is Betsan Corkhill, author of a new book called Knit for Health and Wellness. How to knit a flexible mind and more… . Betsan is a former senior physiotherapist who works as an Activity and Wellness Coach and pain educator. She also runs Stitchlinks (www.stitchlinks.com), a global support group for those who enjoy the therapeutic benefits of crafts particularly knitting. As a physiotherapist Betsan saw that a whole-person approach to health care was often lacking in medical practice. She learned that the process of true healing emanates from deep within the mind and soul and can take place even if ‘cure’ isn’t possible. Since 2005 she has been developing Therapeutic Knitting as a healthcare tool for improving health and wellbeing and also for managing long-term medical conditions. Knit for Health and Wellness is the result of all her research and clinical experience as well as the stories of knitters from around the world. In healthcare settings, Therapeutic Knitting has been used to treat people suffering from stress, depression and other mental health problems, post-traumatic stress disorder, addictions and chronic pain. It’s helped people to live fulfilled lives and break free from the cycle of passivity, problems and prescriptions that so many fall into. Some of the research revealed in the book is fascinating. Did you know that because knitting involves a complex, bilateral and co-ordinated pattern of movements it uses up a lot of brain capacity? Which means the brain has less capacity to pay attention to other issues, so it’s a good distracting technique for people with chronic pain. Or that the repetitive movement involved in knitting enhances the release of serotonin, which can help people to feel calmer and happier? The rhythmic nature of the movements is calming and leads to a meditative-like state. In fact, the Stitchlinks / Cardiff University study that Betsan was involved in found that the more frequently people knitted, the calmer and happier they said they felt. 81% of respondents said they felt happier during and after knitting. And 54% of respondents who were clinically depressed said knitting made them feel happy or very happy. Although knitting is something people can do on their own, anywhere, therapeutic knitting groups are a great way for someone who is experiencing pain, isolation or depression to make friends. The laughing, talking and sharing that goes on in a knitting group is an important part of the healing process. As a result, pain clinics around the world are now including Therapeutic Knitting groups in the services they offer. But it’s not only the unwell who can benefit from the Therapeutic Knitting approach. Even the fit and healthy can use knitting as a tool to deal with the stresses and strains of everyday life. 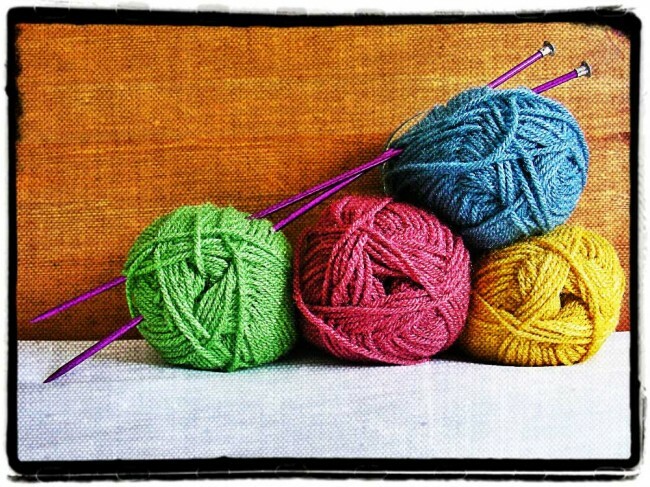 Just 20 minutes a day of knitting can relax you and help you achieve a calm state of mind. What I like about Knit for Health and Wellness, is that Betsan takes the approach that people need to be proactive in their health and wellness. The book is written in the style of a self-help workbook and there is space to make notes and to set personal goals along the way. It’s the perfect book for anyone who is suffering with long-term illness, chronic pain, isolation or depression and has lost confidence along the way as well as those who are interested in knitting and wellbeing. As someone who has experienced years of illness, chronic pain and depression, I find Betsan’s gentle, compassionate tone and insights into the limitations of pain very helpful and encouraging for anyone in that situation. Knit for Health and Wellness is not an instruction manual, so do not expect any pointers on how to actually knit. But it does include some useful tips on how to improve your knitting posture, especially if you suffer from neck, arm, wrist or hand pain. There are also tips on choosing the materials involved like yarn and needles and the different types of knitting projects available. Knit for Health and Wellness should be required reading for anyone working in a healthcare setting. Therapeutic Knitting is such a simple concept, cost-effective too, yet the benefits are enormous and can help people make positive changes in their lives. I can’t help but think that if doctors dished out copies of Knit for Health and Wellness as fast as they dished out anti-depressants and pain killers, the NHS budget crisis could be solved before the next election. 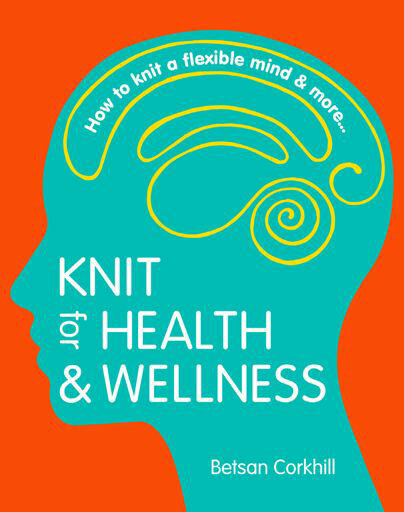 Copies of Knit for Health and Wellness are available from Amazon.co.uk and http://www.knitforhealthandwellness.com/. Omg I started knitting at the age of 3 and haven’t stopped, I have always wanted to own my own knitting shop and design my own knitwear, but life took over, and I spend 33 running pubs, clubs and hotels with my husband and work partners. Through all the years knitting has been my salvation, I don’t really know how to describe it, when I knit, I am relaxed , happy, and stress free. When under pressure or unhappy I will immerse myself in the most complicated patterns I can find (or design myself) and I always feel complete, so at the age of 50 I decided I could not wait any longer and finally opened my own knitting shop, I started to teach and 2 years on am running knitting classes 3 nights a week, many people come to my classes, solicitors under stress, teachers, Clark or the courts, students under stress, and even a couple of teenagers with learning difficulties who’s parents have told me that I have changed their lives, I say not me KNITTING, there is nothing like it, my classes do relax, encourage, uplift, with every project induce pride and worthiness, because everything that anybody makes is an achievement that they all should be proud of, and I make them all feel proud. Tracey, what a wonderful, inspirational story! Knitting truly does have the power to heal and to change lives. May your knitting business go from strength to strength! Quite fascinating. I definitely sleep much better now I am knitting again. I had a break of many years. I’m almost 70 and have had epilepsy for over 40 years. When I don’t sleep well for long periods my fits increase, especially at night. Also when I get more sleep I’m definitely a much nicer person to know and I’ve been convinced this has been through my knitting as I’m less stressed. I’ve actually been sleeping at night now for about two months and will be really interested now to see what happens. Hi Sue. What a wonderful success story on how knitting has helped you. I hope you continue to knit and sleep well. Good sleep is the foundation of good health.